Tha sinn gu math toilichte dà ghoireas ùra sealltainn dhaibh air Obraichean Gàidhlig, an dà chuid airson fastaichean agus airson daoine a’ sireadh obrach. 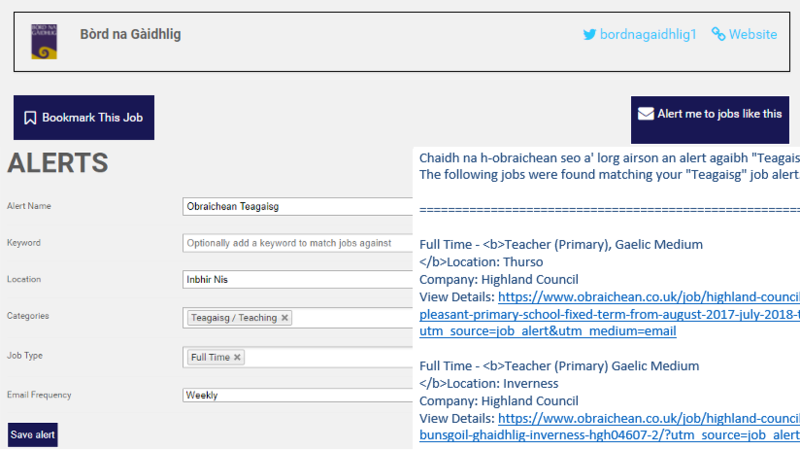 We’re delighted to bring you two new features on Obraichean Gàidhlig to help both employers and job seekers. ‘S urrainn dhuibh a-nis alert sònraichte a dhèanamh dhuibh fhèin airson obraichean anns am bidh ùidh agaibh. ‘S urrainn dhuibh taghadh an seòrsa obrach airson a bheil sibh ag iarraidh alert, neo ‘s dòcha alert a dhèanamh airson obraichean a tha a’ tighinn an àrd timcheall air an sgìre agaibh fhèin. Dèan alerts sam bidh a thogras sibh agus faigh sibh brath post-d gach latha, gach seachdain neo gach cola-deug leis na h-obraichean a tha sibh ag iarraidh. Airson alerts agaibh atharrachadh neo a dhèanamh, tadhail air an duilleag alerts. You can now create special alerts for yourself for jobs that you are interested in. You can choose to create an alert for a specific job area you’re interested in or perhaps an alert for jobs that come up in your own region. Create as many alerts as you want and you’ll receive an email either every day, each week or every fortnight on the jobs that you’re looking for. To manage or create new alerts, visit the alerts page. Airson fastaichean, ‘s urrainn dhuibh a-nis faicinn na tagraichean uile agaibh airson obair air an làrach againn fhìn. ‘S urrainn dhuibh teachdaireachdan a chuir do thagraichean, ‘s fiù ‘s nòtaichean a chumail air na tagraichean a tha sibh ag iarraidh a’ toirt air adhart gu agallamh neo dhan obair. Airson seo fhaicinn, theirg don dhuilleag obraichean agad. For employers, you can now see all applications for a position on our site. 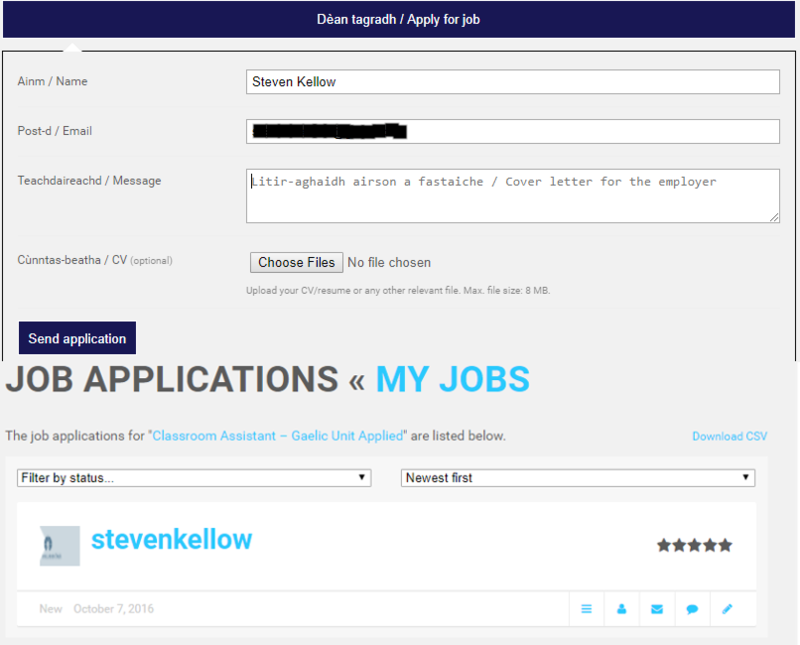 You can send messages to applicants through the site, and keep notes on the applicants such as which applicants to invite for an interview or to hire. Cuimhnich gu bheil goireasan math eile leithid comharraichean ‘s shortcut airson fònaichean-làimhe ri fhaighinn an-dràst cuideachd. Dèan chunntas leinn airson na comharraichean ‘s alerts againn a’ cleachdadh. Remember that other features such as bookmarks and a phone shortcut are available now too. Sign up with us to use bookmarks and alerts with us. ‘S e fìor dheagh ghoireas a tha sibh ris an seo agus tha mi gur moladh gu mòr!